The 16th season of Albuquerque Isotopes baseball saw historic performances on the field, the emergence of the Mariachis de Nuevo México and over 556,000 fans come through the turnstiles at Isotopes Park. The Isotopes finished 2018 with a 63-77 record and were 19.5 games back of first place El Paso in the Pacific Southern Division. Albuquerque ended the year in fourth place for the third time in club history. Manager Glenallen Hill surpassed Lorenzo Bundy in April for the second-most wins all-time and has a 264-304 record in four years as Albuquerque's skipper. Meanwhile, Albuquerque's season attendance of 556,330 was its highest since 2015 and Isotopes Park's average attendance of 7,948 ranked third in the Pacific Coast League. Isotopes Park welcomed its 9 millionth fan in August and its overall total in 16 years now sits at had 9,107,597. The Isotopes transformed into the Mariachis de Nuevo México for four games in Albuquerque as part of Minor League Baseball's initiative celebrating Hispanic heritage and culture. Over those four dates, a total of 55,235 fans packed Isotopes Park, an average of 13,809 fans per game. The Mariachis were one of 33 teams across Minor League Baseball to compete for the "Copa de la Diversión" or "Fun Cup." The season-long "Copa" series was specifically designed to embrace the culture and values that resonate most with participating teams' local Hispanic and Latino communities. Isotopes Park transformed from "The Lab" into "The Plaza" during the Copa Cup dates, complete with traditional decorations, piñatas and mariachi bands playing both outside and inside the ballpark. The first Mariachis de Nuevo México game was a record-breaking evening at Isotopes Park on Cinco de Mayo. The 16,975 fans to attend the game was the largest single-game crowd in Isotopes history, surpassing the previous record of 16,348 set on July 4, 2014. Once again, Isotopes Park was recognized as one of the top ballparks in Minor League baseball. Isotopes Head Groundskeeper Clint Belau received a Presidential Commendation from the Pacific Coast League and PCL President Branch Rickey for his excellence in sports turf management for the 2018 season. Belau is in his sixth season with the Isotopes, but first in his current role as Head Groundskeeper. The PCL also honored Isotopes third baseman Josh Fuentes for his impressive first season in Triple-A. Fuentes was selected to the All-PCL Team, named PCL Rookie of the Year and capped his campaign with the 2018 Pacific Coast League Most Valuable Player Award. Fuentes became the fifth player to be selected both the PCL Rookie of the Year and MVP while becoming the first ever to win the aforementioned awards and be named the Triple-A All-Star Game MVP. The 25-year-old is the second Isotope to win the PCL's MVP award as Joc Pederson took home the honor in 2014. Fuentes led the league in hits (180), games played (135), at bats (551), doubles (39), extra-base hits (65), total bases (285) and runs scored (93). The Orange County native's 180 hits this year were the most in a single-season by an Isotope and the most in Minor League Baseball in 2018. Fuentes' .327 batting average finished as the sixth-best in the league. As a team, the Isotopes compiled a .285 batting average for the season, ranking second of 16 clubs in the PCL. Outfielder Mike Tauchman finished right behind Fuentes in the batting title race with a .323 average. The 27-year-old also ranked third in the league in on-base percentage (.408) as well as slugging percentage (.571). Tauchman was selected to the All-PCL Team and the Isotopes Players' Choice for Most Valuable Player for the second-straight year. Tauchman was the only Isotope to receive a Player of the Week accolade from the PCL in 2018 and was also named the League's Player of the Month for May. Daniel Castro came four games away from Tauchman's club record 28-game hitting streak, hitting safely in 24 consecutive contests from April 6-June 7. Castro's streak was tied with Dustin Garneau's as the second-longest in team history. The Isotopes led Minor League Baseball for the second-consecutive year in triples with 67. Albuquerque hit 33 of its 67 triples at Isotopes Park. Fuentes hit a team-high 12 triples, one shy of tying the Isotopes single-season record established by Robert Andino in 2007. Albuquerque finished fifth in the league in home runs, belting 154 long balls. Jordan Patterson tied his career-high with 26 home runs to pace the team, while also ranking third in the circuit. On August 7, Patterson became the Isotopes all-time home run king hitting his 61st round-tripper to surpass Jason Wood for the franchise record. Patterson has accumulated 66 home runs over his three seasons in Albuquerque and has 107 long balls during his six-year professional career. The 26-year-old recorded both his 100th career home run and 100th hit-by-pitch in the same game on July 1 at El Paso. 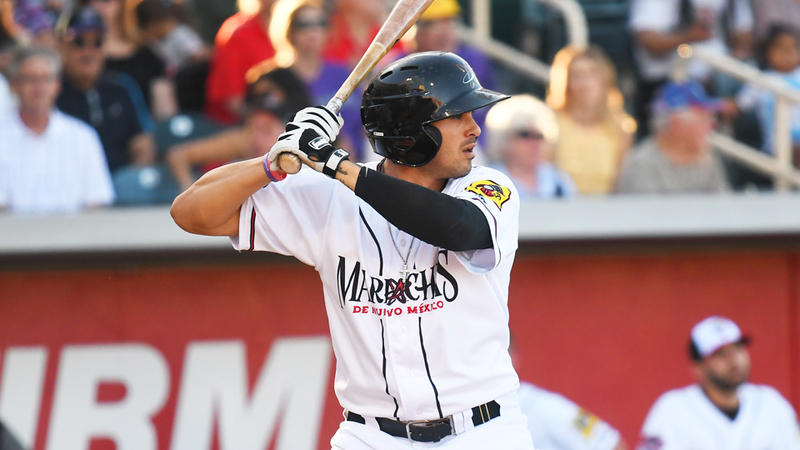 The Mobile, Ala. native not only became the Isotopes all-time leader in home runs in 2018, but also claimed the franchise's hit-by-pitch record being plunked 50 times in an Albuquerque uniform. The first baseman/outfielder was hit 22 times this year, tying Mike Kinkade for the most in a single-season in Isotopes history. Patterson was the only Isotope to hit a walk-off home run in 2018, but was one of six players to record a multi-homer game. Albuquerque compiled six sets of back-to-back homers, two inside-the-park home runs (Raimel Tapia and Derrik Gibson ), one game-opening home run (Garrett Hampson) and six grand slams. Tauchman's team-high three grand slams tied the team's single-season record. Twenty Isotopes went deep in 2018 with the oldest being 38-year-old Matt Holliday . Holliday spent three weeks with the Isotopes in August, compiling a .346 batting average, three home runs and 14 RBI. The first baseman/outfielder hit safely in 11 of 15 games before the Rockies called him up on August 23. Brandon Emanuel's pitching staff finished the season 14th in the PCL with a 5.34 team ERA. Isotopes hurlers struck out the tenth-most opposing batters in the league in 2018, fanning 1,081. Albuquerque issued the seventh-most free passes in the league, walking only 464 opposing batters on the year. The pitching staff surrendered 182 home runs during the campaign, eight ahead of Las Vegas for the most in Minor League Baseball. The Isotopes sent 15 different starting pitchers to the hill in 2018, with six making double-digit starts on the year. The pitching staff logged 32 quality starts over their 140 games this season led by Brett Oberholtzer's eight. Oberholtzer, David Holmberg and Scott McGough led the club with seven wins each in 2018. Jeff Hoffman had the most strikeouts on the team for the second time in three years, punching out 102 batters. The right-hander ranks second all-time in Isotopes history with 273 strikeouts behind John Ely with 320. Hoffman also established the Isotopes all-time losses record with 20 during his time in Albuquerque. One of the Rockies top pitching prospects Peter Lambert joined the Isotopes staff on the Fourth of July. The 21-year-old right-hander went 2-5 with a 5.04 ERA in 11 outings in Triple-A, but ended the season on an 11-inning scoreless streak. The scoreless streak was the longest by an Isotopes pitcher in 2018. Seven Albuquerque relievers recorded at least one save on the year, contributing to the club's 28 saves in 45 opportunities. DJ Johnson was first in the PCL in games finished with 43 and third in saves with 18. The Oregon native's games finished total was the third-highest for a single-season in Isotopes history while his 18 saves rank fifth-best. Johnson recorded a career-high 84 strikeouts and registered a 13.7 (84k/55.1ip) K/9IP ratio. The right-hander became the 14th Isotope reliever to ever appear in 50 games in a season and the first since Simon Castro in 2016. Jerry Vasto also provided a consistent arm oyt of the bullpen. The southpaw compiled a 3.16 ERA in 37 games and was voted the Isotopes Players' Choice for Pitcher of the Year. Vasto also received his first call to the Majors in 2018, making his Major League debut on June 10. Albuquerque ranked 14th in the PCL with a .980 fielding percentage in 2018, committing 102 errors in 140 games. Double plays headlined the Isotopes defensive effort this season, as they turned 160 twin-killings for the most in Minor League Baseball and finished 21 ahead of the next closest team (Round Rock, 139). Patterson was a part of a league-high 68 double plays at first base while Fuentes was tied for the PCL lead in double plays turned at third base with 25. Fuentes recorded a .966 fielding percentage at the hot corner, the best for any player at his position in the PCL and was voted the Isotopes Defensive Player of the Year. The Isotopes accumulated 31 outfield assists led by Tauchman with a career-high 12 which was also the fourth-highest total in the circuit. Tauchman is the 10th Isotope to ever reach double-digits in outfield assists in a single-season and was two away from Brett Carroll's record of 14 from 2007. The 27-year-old from Illinois showed off his arm on July 9 in Columbus, Ohio when won the 2018 Triple-A All-Star Outfield Throwing Competition. Tauchman was one of three Isotopes to be selected to the 2018 Triple-A All-Star Game in Columbus, joining Fuentes and Johnson. Tauchman went 2-for-3, with a double, two RBI and a stolen base in the contest. Johnson faced two batters, allowing a hit and striking out a batter. Fuentes finished the evening 2-for-3 with a home run and two RBI en route to winning the Triple-A All-Star Game MVP. Fuentes is the second Isotope to receive an All-Star Game MVP award with Valentino Pascucci taking home the award in 2007. The Isotopes had 56 players suit up for them during the 2018 campaign and tallied 224 total transactions. Seven players: Shane Broyles , Johnson, McGough, Anthony Bemboom, Jan Vazquez , Fuentes and Gibson spent the entire season with the Isotopes, with Johnson, Bemboom and Fuentes being active for all 140 games. Twenty-one members of the Isotopes also appeared for Colorado this season. Of those promoted to Colorado, 12 were on the Isotopes Opening Day roster. Eleven players made their Triple-A debut in 2018 with the Isotopes while Albuquerque hosted 10 Major League rehab assignments. Seven Isotopes players Noel Cuevas , Harrison Musgrave , Sam Howard , Vasto, Yency Almonte , Hampson and Johnson made their Major League debuts during the 2018 campaign.